José Spisso, Marcelo Pelleriti and Leo Borsi are Argentinians who work in the Old Continent and have managed to leave their quality mark on wines recognized by the international critics. Like tennis and football, wine also has Argentinian ambassadors in Europe. Such is the case of Marcelo Pelleriti in France and José Spisso in Spain, who work in harvest in both Argentina and Europe. They got the star part not only for introducing innovation in the tradition. They are ambassadors of Argentine culture and wines in the Old World. In WineSur’s visit to Europe, we also met Leo Borsi, winemaker at Domaine du Vieux Télegraphe in Chateauneuf du Pape. With the Argentinian winemakers’ arrivals in Europe, relationships take precedence over trade competitions; exchanges entail companionship and broaden technicians’ vision in pursuit of a sole outcome: obtain the best possible quality, using resources within their reach. This year is the 10th anniversary of Marcelo Pelleriti, Monteviejo’s winemaker, in charge of the chateaux belonging to Catherine Peré -Vergé in Pomerol. In may, so many comments were made on the news about the scoring that Robert Parket granted to Chateau Le Gay (97+ pts) and La Violette (97 pts). “For some time, with all changes introduced, we are among the Bordeaux’ 20 leading chateaux”, underlined this young winemaker who has half of his heart -and also of his music- in the Old Continent. His work at Le Gay, La Violette and Montviel, where he is accompanied every year by Marcelo and Ceferino, his right-hand collaborators in Argentina, apart from a young team, is not so different from the way of working with Malbec in Mendoza. “The difference lies in the vineyards”, maintained Marcelo, while he looked around the 33 hectares, spread over different areas, where each plot or row has name and surname. “Since my arrival, I have been exploring the vines and discovering their characteristics”. It seems incredible that in a small area, compared with vineyards in Argentina, there have been so many different terroirs, but it is so. “The secret is to handle the vine and obtain well-developed polyphenols; the rest is relatively easy”, commented Pelleriti. The wines that he makes have managed to go on “en primeur” sale at a price around 100 euros per bottle. 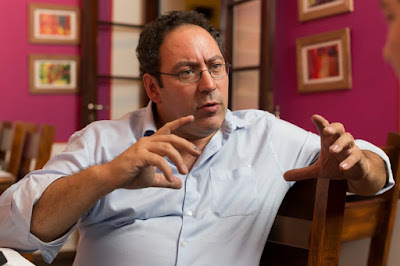 José Spisso, from San Martín, in the east of Mendoza, is the right-hand man of an active businessman, José Manuel Ortega Gil Fournier, who owns wineries in Chile, Argentina and Spain. While Ortega spends most of time flying to sell wines, Spisso is in charge of the three wineries’ winemaking. Nowadays, Ribera del Duero wines -Urban, Spiga, Alfa Spiga and O. Fournier Tempranillo- are very well sold in the United States, Europe, Canada and South America. He had to develop a great job of vineyard identification when he started working in Spain, in 2001. “In these regions, estates are very fragmented and some producers only have 5 rows and they are far from each other. As time went by, we were developing a transformation and today, we have mostly own grapes grown in a 50-hectare plot”. This way, Ortega Fournier has become one of the 5 largest estates in Ribera del Duero. Moreover, José took part in the technological transformation of the winery, by means of the incorporation of stainless steel tanks and the restoration of epoxy-coated concrete vats from the old winery. As well as his Argentinian colleagues, he maintains that the interesting thing of Duero is in its soil: “here, we have 50 cm of stone and underneath there is clay. This enables a better ripeness of Tempranillo”. Duero has enabled José and his Spanish colleague, Laura, to conduct micro-vinifications with the purpose of introducing subtle changes of style. “According to some critics, our wines are too South American for Duero and too European for South American journalists”, joked José, whose aim in Spain and Argentina is to reach maturity to make wines boasting greater elegance. Leo Borsi is from San Rafael, but lives in France for 14 years and he has worked for 7 years as Chief of cellar at one of the well-known wineries in Chateauneuf du Pape. Since his arrival, his focus has been less on the winemaking process and more on the land. Regarded as one of the most important in Chateauneuf, Vieux Telégraphe produces 500 thousand bottles. Its top wine production amounts to 200 thousand bottles that are sold at the retail price of 50 euros. Its 80-year-old vineyards are its quality label. “Although the quality of grapes is excellent, this also sets us a great challenge regarding yield and profitability”, commented the winemaker. Every year, among other issues, he asks the control committee for permission to grow Malbec but he has not achieved it yet. “The challenge of a young winemaker from other country is to help the place to grow and make people understand that the incorporation of new techniques is possible, such as cold pre-fermentation or others that enable us to attain a higher quality. On this point I focus my work every day”, he emphasized. José Spisso, Marcelo Pelleriti y Leo Borsi son argentinos que trabajan en el Viejo Continente y lograron imponer su sello de calidad en vinos reconocidos por la crítica internacional. Leo Borsi es oriundo de San Rafael. Vive en Francia hace 14 años y es jefe de cava (primer enólogo) de una de las más reconocidas bodegas de Chateauneuf du Pape desde hace 7 años. Describe a este tiempo como muy interesante, ya que desde su llegada, la empresa (que también es dueña de La Roquétte) pasó de enfocarse en los procesos de elaboración a estar "pura y exclusivamente en la tierra, subdividiendo las parcelas para conocer a fondo su potencial". Borsi estudió en Borgoña y pese a su formación local no le fue sencillo incorporar nuevas ideas en una de las AOC más famosas de la Côte du Rhone. "Cuando llegué aquí trabajábamos mucho en la elaboración pero de a poco fui atribuyendo menos importancia a esos temas y más al viñedo", comenta este joven hacedor de vinos, más preocupado por el terroir que por los procesos de vinificación. Considerado uno de los más importantes de Chateauneuf, Vieux Telégraphe e produce 500 mil botellas. De su vino top se producen 200 mil botellas que se comercializan a 50 euros al público. Sus viñedos de 80 años son su marca de calidad. "Si bien la calidad de las uvas es excelente, esto también nos plantea un gran desafío en cuanto a rendimiento y rentabilidad", confía el joven enólogo. Impulsor de muchas iniciativas dentro de la bodega y la región, Borsi insiste en militar por lograr libertadas que permiten a los chateaux de Francia adecuarse más ágilmente a las demandas de los mercados. "Vemos que los técnicos en Francia tienen limitaciones. Hace algunos años teníamos muchas restricciones, producción, porcentaje de Grenáche en el vino y determinada densidad de plantas por hectárea. Eso lo cambiamos casi todo, salvo el nivel de rendimiento, cuando pasamos de las AOC a las IPG y lo pudimos implementar hace dos años". Cada año pide también al consejo regulador de su región que le permita cultivar Malbec (la AOC tiene 13 variedades permitidas pero el grueso es Grénache), pero aún no logra que lo autoricen. "El desafío de un enólogo joven y que viene del otro lado es ayudar a evolucionar; a que la gente aquí entienda que podemos incorporar técnicas nuevas, pre-fermentativas en frío, finales en caliente para lograr más color, por ejemplo u otras que nos permitan lograr mejores resultados en la calidad. Allí enfoco mi trabajo diario".